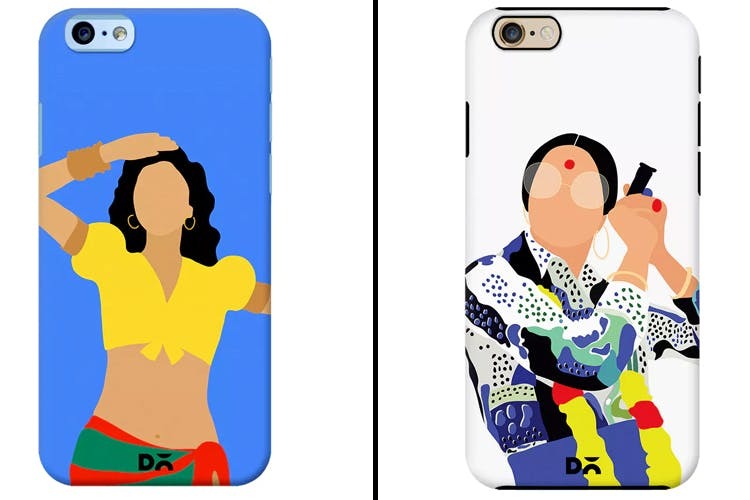 Give your phone an upgrade with these minimal Bollywood-mused phone covers by Shweta Malhotra. Shweta Malhotra is a graphic designer in Delhi, who turned the illustration scene upside down when she drew looks from the Fashion Week into her own rendition on paper in 2013. Post that, she has done a variety of projects, and has designed some really funky phone covers. We are especially coveting the ones which are on iconic Bollywood actors and actresses, such as Rekha, Madhuri Dikshit from the ek do teen song, Zeenat Aman’s hippie avatar from dum maaro dum and even Sharmila Tagore’s leopard print bikini look. The cases are available via Daily Objects, so the quality need not be worried about. The cases are available for most phone models, and are priced somewhere between INR 500-1200, and are discounted for the most part. Buy them here. There are other cool covers including those of supermodel femme Chloe, generic fashion-inspired models, and general fun graphics. You can also buy her designs as cushion covers and kits on the site, and just as prints to put up on your fridge or wall from her website here. There’s no shame in loving the Bollywood fame. Buy yours now, or gift it to the friend who’d much sooner go back to that flamboyant era than that of today.